Equally, if a country is invaded by the enemy, it becomes an individual obligation of each of its inhabitants – including women – to take up arms to defend and to fight off the enemy. What are the kinds of Jihad? 2. Fighting the mischief makers. This also can be done with hand, tongue and heart. The Prophet said, “He who amongst you sees something abominable should modify it with the help of his hand; and if he cannot, then he should do it with his tongue, and if he cannot, (even) then he should (abhor it) from his heart, and that is the least of faith.” (Recorded by Muslim on the authority of Abu Sa’eed Al-Khudri – may Allah be pleased with him). 4. Struggling against one’s own soul. That is by forcing it to learn matters of the religion and to act upon them, and by keeping it away from desires and resisting its frivolities. Making Jihad against one’s soul is, undoubtedly, one of the great acts of Jihad. 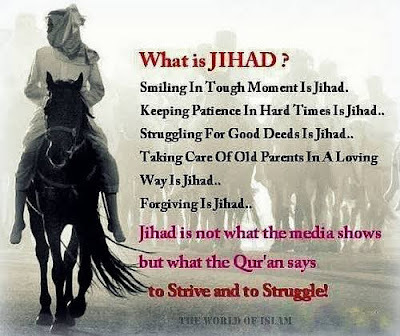 That is why it is called, Al- Jihad Al-Akbar (The Greatest Jihad). What are the pillars of Jihad? 1. Good intention: This is because, deeds are judged according to the intention of the doer; and good intention in Jihad means the purpose of engaging in it should solely be for the sake of promoting the Word of Allah. Based on this, it is incumbent upon any group of Muslims that wants to fight in the way of Allah to liberate itself first from the grip of the disbeliever and give pledge of allegiance to a man from among the group who has more of the qualities of leadership such as knowledge, piety and ability. It should then organize its ranks, get its acts together, and fight with its tongue, wealth and hands until Allah makes it victorious. 3. Preparing the tools and getting the necessary materials such as weapons and men ready for Jihad as much as possible. And all efforts must be made in this regard. This is due to Allah’s statement, “And make ready against them all you can of power”. However, if the enemy attacks the town by surprise or the Muslim leader specifically appoints the man to participate in Jihad, then the parents’ permission is no longer regarded as essential. 5. Obedience to the leader: If a person partakes in Jihad, having disobeyed the leader and dies in that state of disobedience, his death is that of the age of ignorance. This is due to the saying of the Prophet, “Whoever disapproves of something done by his ruler then he should be patient, for whoever disobeys the ruler even a little (little = a span) will die as those who died in the Pre-lslamic Period of Ignorance. (i.e. as rebellious Sinners).” (Recorded by Al-Bukhari and Muslim on the authority of `Abdullah bin `Abbas – may Allah be pleased with him).